Class Description: Enjoy an Attending the Spine series that incorporates Modified Side Planks and an arc mandala with Pigeon and Twists, followed by neck and shoulder work, to Seated Forward Fold, roll ups, a standing mandala with Side Angle, Scandasana, Revolved Side Angle, Tree, Triangle, and Big Toe Posture 1st and 2nd variations; then down to the mat for Restorative Bridge, Apanasana, Happy Baby, Twists, and Savasana on the belly. Class Description: Enjoy yummy movement close to the earth with an infinity pattern addressing side bodies, twists and external rotation of the hip, followed by a standing full rotational mandala with Warrior 2, Side Angle, Triangle, Scandasana, and standing balance poses of Tree and Figure Four; class then comes back to the floor for Happy Baby, reclined twists and Savasana. Class Description: Enjoy a shorter restorative practice here with Supported Fish pose, side body stretch, Restorative Child and belly on the bolster. Class Description: Class begins with a 45 minute restorative piece with Supported Fish, Restorative child and belly on the bolster, then proceeds to movement with a yummy infinity pattern followed by a standing full rotational mandala consisting of Warrior 2, Side Angle, Triangle, Scandasana and standing balance poses of Tree and Figure Four; class returns to the floor with Happy Baby, reclined twists and Savasana. Class Description: A Power Vinyasa Class full of yummy movement that starts with a Pigeon mandala that has an infinity loop; followed by uplifting patterns of movement done in vertical arcs that continue external rotation of the hip with Warrior 2, Triangle, Side Angle, Half Moon and Big Toe variations 1 and 2; class then switches to a linear format with Warrior 1, Splits Prep and Standing Splits with balance postures of Warrior 3 to Figure Four; then another squared hip sequence leading to Dancer Pose; class closes with a focus on back extension, reclined twists, Leg Up the Wall Pose or Shoulder Stand to Savasana. 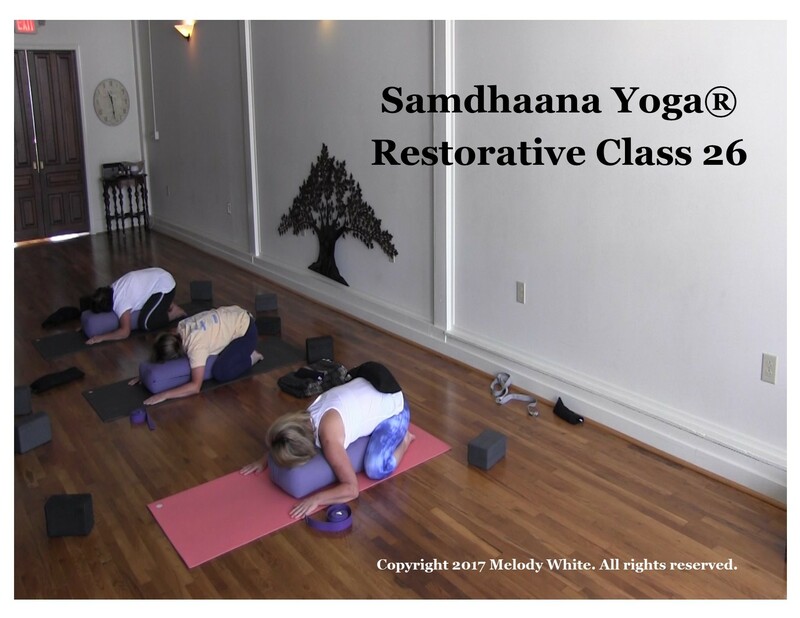 Class Description: We've categorized this class as both an Active Restorative Class and a Foundations Class and it's one of our favorites; contains both movement and yummy restorative sections. Class starts with seated breath work and neck and shoulder movement, followed by Restorative Child and belly on the bolster, then making our way to gentle movements of hip circles, Poster Girl, Thread the Needle, Apanasana, Happy Baby, restorative twists, and a Pigeon twist mandala that concludes with Sphinx, Seal and crossover twists. Again, one of our all-time favorites! Class Description: A Power Vinyasa Class that opens with Modified and Full Side Planks placed in Sun Salutations which includes an infinity pattern to address both sides of the body and bring a very soothing aspect to the subtle body and balance to one's energy; then a linear squared hip series for back extension, hip flexion and extension, and moving to walking Dakasanas; next a full rotational mandala focusing on external hip rotation with a vertical front and horizontal return and standing balance postures of Half Moon, Figure Four, Big Toe 1st and 2nd variations; class then moves to the floor for more back extension with Bridges and closes with a twist series done in a linear format with standing balance poses of Eagle, Half Moon, Tree, and arm balance Side Crow. Class Description: A Power Vinyasa Class with multiple mandala patterns; class begins with an Attending the Spine full rotational mandala, then continues with a focus on external hip opening done in full rotations with a vertical arc on the front and a horizontal return, and closes off with a tag that leads to Big Toe, 1st and 2nd variations; class then moves to a squared hip series done in a vertical arc with a horizontal return that includes Crescent Lunge and Warrior One taken with movement and leading to Figure Four with Big Toe 1st and 2nd variations to standing Apanasana; class closes with rolling Forward Folds and a set of Boat Poses to reclined extension for angel wing breathing, then moves to Happy Baby and reclined twists, followed by Savasana. Class Description: A morning restorative class that begins with a short standing series to awaken the body and moves quickly to Restorative Child and belly on the bolster, followed by integrative movement; class ends with Restorative Fish to restorative twists done with a bolster, to rolling Forward Folds to end class. Earth born friendly. Class Description: A class with plenty of movement; opens with 2 sun salutations and moves into an infinity pattern with a focus on side body length, twists, and hamstring lengthening; then moves to focus on back extension with Seal, Camel and Bridge; peak postures include Revolved Triangle, Standing Big Toe 1st and 3rd variations, and Camel. Class Description: An intermediate level vinyasa practice that opens the hips with two half rotations and moves on to a tag for more hip opening; then a squared hip sequence that leads to Dancer, Figure Four and an option for Flying Pigeon; class ends with lots of yummy floorwork including 5 Bridges (and option for Wheel) or it can be taken as Restorative Bridge; class closes out on the belly with Thread the Needle, Dragonfly, crossover twists, and belly on the bolster. Class Description: A Power Vinyasa Class that starts in Mountain Pose at the back of the mat and leads to an Attending the Spine series with Modified Side Planks and Full Side Planks; class continues with two full rotational mandalas done in a vertical arc for lift, with a tag that addresses open hip postures and leads to Big Toe Posture, variations 1 and 2, to Krishna"s Pose; followed by a squared hip series that leads to Dancer; then another full rotational mandala that includes options for Easy Bird of Paradise and Flying Splits. Class Description: A morning restorative class that has some movement in the beginning to wake up the body; contains short standing series followed by Restorative Child, belly on the bolster, restorative twists and restorative Half Virasana, with supported integrative movements throughout the practice. Class Description: Class starts with neck and shoulder work and moves to floorwork done on the back, then moves into restorative twists followed by Restorative Child and belly on the bolster; then movement begins with Modified Side Planks and attached to Sun A’s; class continues with two full rotations done in an open hip pattern accompanied by twists; class ends with roll backs and seated forward fold, Leg Up the Wall Pose and Savasana. Class Description: A Power Vinyasa Class with lots of movement; class opens with two halves addressing twists, side body length and an open hip sequence;more open hip done in a linear format topped off with standing Tree Pose; this sequence is capped off with a shoulder opener, Malasana and Crow at the back of the mat; class continues with two full rotations that include a vertical arc on the front and horizontal on the back with Scandasana and a twist, then moves into Flying Splits to 3 point, to Plank, vinyasa and Down Dog; final sequence is a twist series that begins with floorwork moving into an infinity loop that takes you to standing twists including Eagle, Full Bird and Big Toe, 3rd variation; sequence closes with Chair in a prayer twist and option for Side Crow; class ends with seated forward fold and options for Leg Up the Wall or Shoulder Stand to Savasana. Class Description: Another yummy feel-good soft vinyasa flow class with a heart-down moving floorwork series to a heart-up moving floorwork series; class continues with a full rotational mandala that has a twist series on the front leading to an open hip pattern on the back; contains standing balance postures of Eagle and Tree Pose; class ends with restorative heart opening and Restorative Child and belly on the bolster. 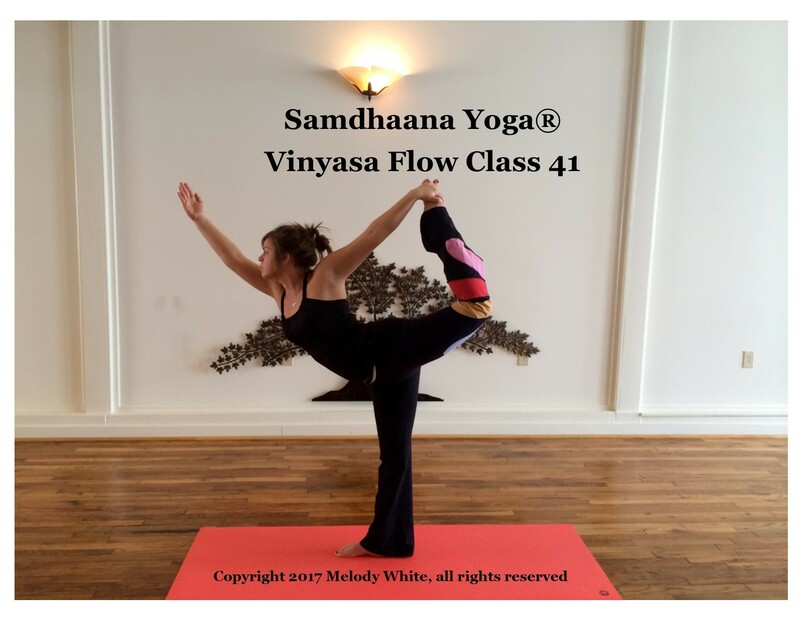 Class Description: A basic vinyasa class with a restorative ending. Class begins with an Attending the Spine series that takes place in a full rotational mandala with an infinity loop - this is a yummy feel-good series that takes about 45 minutes, then class moves on to focus on back extension with 2 full rotations done on a horizontal plane; includes Crescent Lunge, Modified Crescent Lunge and standing balance pose of Dancer; this standing series is followed by integrative floorwork of Puppy Pose, Seal, and Camel and concludes with Thread the Needle and reclined restorative twists. Class Description: Class begins in Supported Fish, moves to side bodies and Restorative Child; after 45 minutes of stillness, class continues with soft integrative movements of Down Dog, Gate, Spinal Balance, Poster Girl, Thread the Needle and Happy Baby done in an infinity pattern, followed by movement for the cervical spine.